This aerial photo provided by the Santa Barbara County Fire Department shows mudflow and damage to homes in Montecito, Calif., Jan. 10, 2018. Eight people are missing following mudslides in the state of California, county officials said Thursday, as rescue workers and search dogs continued to look for victims. The new figure was announced as authorities investigated missing persons reports, said Santa Barbara County spokeswoman Amber Anderson, adding that the death toll remained at 17. Flash floods and mudslides triggered by heavy rains early Tuesday led to the deaths and demolished a number of homes north of Los Angeles, where wildfires last month stripped the hills of trees and vegetation. 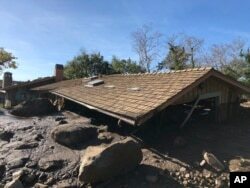 In this photo provided by Santa Barbara County Fire Department, mudflow, boulders, and debris from heavy rain runoff from early Tuesday reached the roof of a single story home in Montecito, Calif., on Jan. 10, 2018. Hundreds of rescue workers continued to search through mud and search dogs climbed atop debris to rescue residents trapped inside homes or stuck in ankle-deep muck. Residents were stunned to see their cars swept down the street by currents of brown water. Others, covered head to toe with goo, could be seen trudging through the thick mud, carrying whatever they could grab. Police used bulldozers to push mud off a major north-south highway Tuesday, snarling the usual Los Angeles morning commute. The December wildfires burned brush and vegetation that would have normally soaked up heavy rainfall on the hills.